Please note: The photos on this page have come from clipart CD's which allow use on educational internet sites and in school projects or they have been contributed by viewers. You are free to use all of it in book reports or for your personal website. See KidZone Bibliography for more information. Adult female monarchs lay their eggs on the underside of	milkweed leaves. These eggs hatch, depending on	temperature, in three to twelve days. thanks to Tanya for sending this in! of a Monarch pupa affectionately know as "Billy Bunny". We also have a photo story provided by Linda. After awhile, the caterpillars attach themselves head down to a convenient twig, they	shed their outer skin and begin the transformation	into a pupa (or chrysalis), a process which is	completed in a matter of hours. The pupa resembles a waxy, jade vase and becomes increasingly transparent as the process progresses. 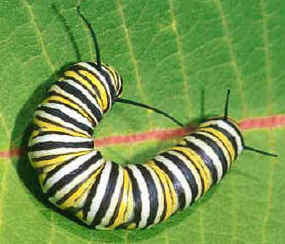 The caterpillar completes the miraculous transformation into a beautiful adult	butterfly in about two weeks. You can see photos of the entire process of a monarch butterfly emerging from its chrysalis at photo story provided by Linda. The butterfly finally emerges from the now transparent chrysalis. It inflates its wings with a pool of blood it has stored in its abdomen. When this is done, the monarch expels any excess fluid and rests. The butterfly waits	until its wings stiffen and dry before it flies away to start the cycle of life all over again. Eastern populations winter in Florida, along the coast of Texas, and in Mexico, and return to the north in spring. 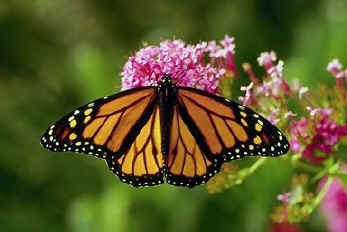 Monarch butterflies follow the same migration patterns every year. 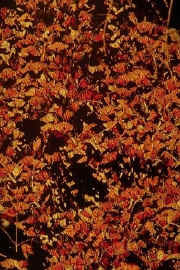 During migration, huge numbers of butterflies can be seen gathered together. Nope, those orange things to the left are not autumn leaves... They're hundreds of Monarch butterflies! 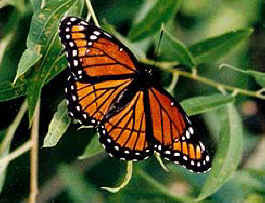 Most predators have learned that the monarch butterfly makes a poisonous snack. 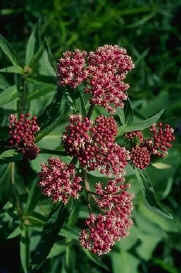 The toxins from the monarch's milkweed diet have given the butterfly this defense. 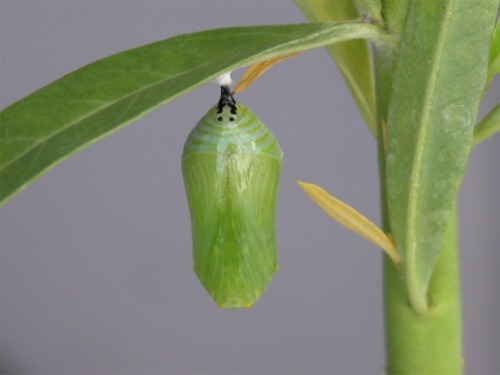 In either the caterpillar or butterfly stage the monarch needs no camouflage because it	takes in toxins from the milkweed and is poisonous to predators. 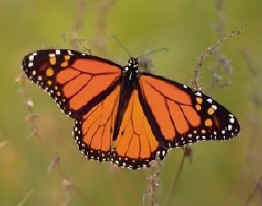 Many animals advertise their poisonous nature with bright colors... Just like the monarch! He's evolved to look like the poisonous monarch to the right so that predators will avoid him too! Still can't tell them apart? Notice that black stripe on the bottom wings of the Viceroy. That's the give-away! It's easily seen in the photos, but birds flying overhead looking for lunch cannot distinguish between the two.